2014 JYJ JAPAN DOME TOUR ～一期一会～ was the third Japanese nationwide concert tour and fourth overall live concert of JYJ in Japan. The tour served as a comeback concert of JYJ in Japan after performing the 2013 JYJ CONCERT IN TOKYO DOME: THE RETURN OF THE JYJ and was organized to support JYJ’s Just Us album and new Japanese single, Wake Me Tonight. The tour kicked off with two shows in Tokyo, and continued onto two more major cities in Japan from November to December. JYJ performing “Be The One” in Tokyo. Photo: C-JeS Entertainment. The ‘一期一会 (Ichigo Ichie)’ tour, or also known as ‘once in a lifetime encounter’ in English, was first announced by C-JeS Entertainment on October 17, 2014 through JYJ Japan Official Website but the dates for the shows were not revealed until October 21, 2014. The tour was organized after constant requests from Japanese fans as soon as the 2014 JYJ Asia Tour Concert was announced in June 2014. On December 8, 2014, additional seats were announced for the Osaka shows. JYJ performed songs from their The Beginning, In Heaven, Just Us albums, Wake Me Tonight Japanese single, and members’ solo albums including Incredible, and WWW. The show lasted for about three hours. Rehearsals took place on October 31, 2014. JYJ was supported by 16 backup dancers. 25 songs were performed in each show, among which only eight were Japanese tracks. The arrangement of songs and concert set list performed in the tour were heavily based on the The Return Of King tour. For the solo performances, Jaejoong covered “Arukitai (歩きたい)”, a Japanese rendition of “걷고싶다(Walking Along)” by Cho Yong Pil, “Ultra Soul” by B’z, and sang “Butterfly”. Besides “Incredible”, Junsu also performed two cover songs: Miyuki Nakajima’s “Sora no Kimi no Aida ni (空の君のあいだに)” and Ai’s “Story”. Yoochun sang Masaharu Fukuyama’s “Saiai (最愛)”, “I Love You”, and “서른..(Thirty..)” throughout the tour. JYJ on stage in their various Christmas costumes in Fukuoka. Photo: C-JeS Entertainment. In Osaka, Jaejoong covered Remioromen’s “Konayuki (粉雪)” for his solo performance and Miyuki Nakajima’s “Keshou (化粧)” in Fukuoka. 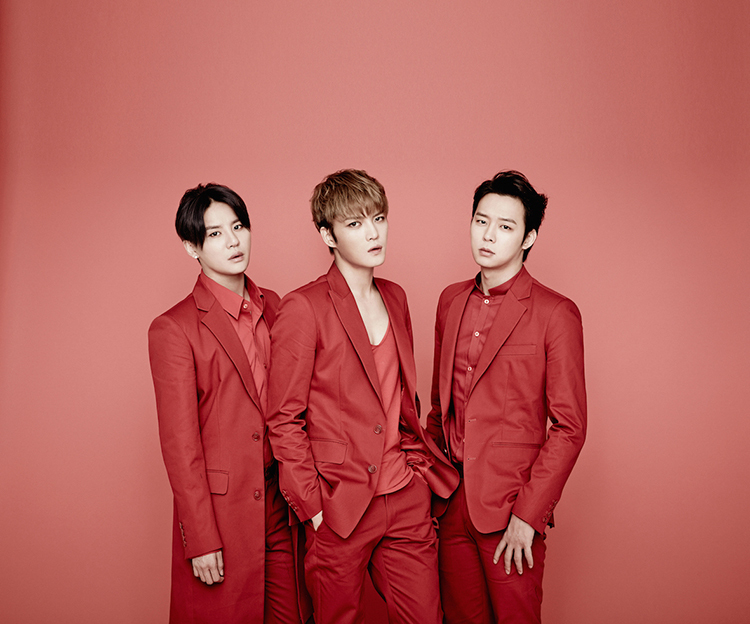 JYJ performed “Wake Me Tonight” for the first time in the two-day Tokyo show before the official release of their Japanese single of the same name on January 21, 2015. The trio added a 2006 TVXQ! song, “Begin”, into the set list as the double encore. 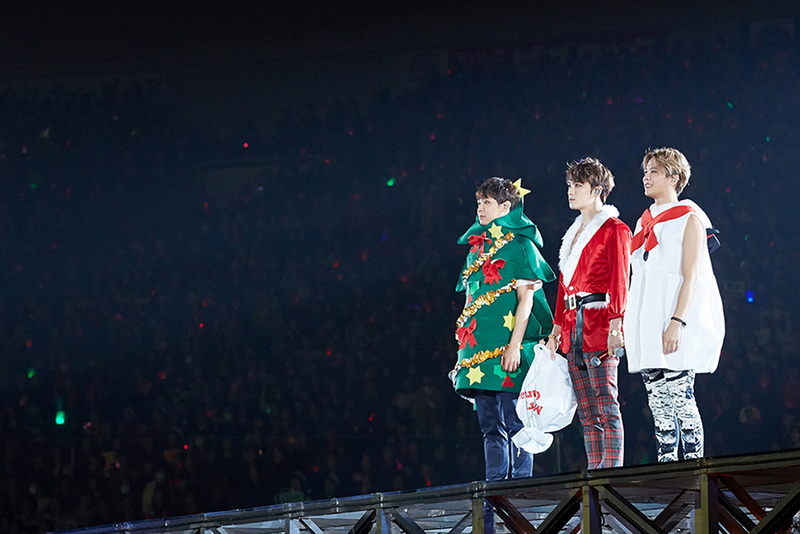 During the December 24th’s show in Fukuoka, JYJ prepared a startling event for the fans to commemorate the Christmas eve by appearing on stage in various Christmas costumes in “So So”: Junsu as the snowman, Jaejoong as Santa and Yoochun as the Christmas tree. In the same show, JYJ did a short harmonic acapella of songs including “Thanks To”, “Stand By U” and “どうして君を好きになってしまったんだろう？” on stage during the closing ment. JYJ’s press conference in Tokyo. Photo: C-JeS Entertainment. A special concert website was set up for the tour on October 21, 2014. The first promotional poster for the tour was unveiled through the official ticketing site, Ticket PIA, on November 11, 2014. 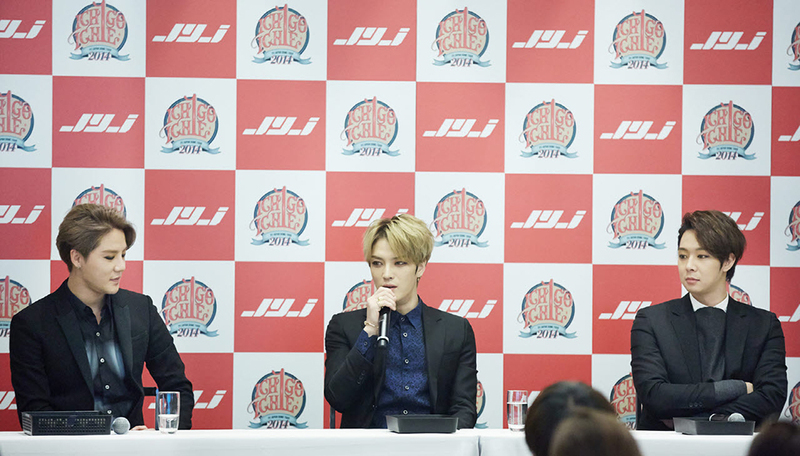 JYJ held press conferences for the tour at the Tokyo Dome Hotel on November 17 and 19, 2014. As many as 42 Japanese media companies awaited the band’s arrival. At the first press conference, JYJ talked about how the tour’s title relates their past moments in the early debut. Jaejoong recalled their first stage performance in Budokan when he was a TVXQ! member while Junsu said it was when they were singing “Proud” towards the end of that show. At the second conference, Junsu explained why they include “Begin” in the Ichigo Ichie tour, “We wanted to present a nostalgic song to send our message to our fans on how we feel about them”. The singer added that the band did not have the opportunity to sing this song live on stage but only after they’ve won a legal battle against their former Japanese agency, Avex. On the selection of Cho Yong Pil’s “걷고싶다(Walking Along)”, Jaejoong commented at the conference, “I heard the song while heading to Jeju Island for filming. I figured many people would not know the song and it’s a shame to enjoy it alone. I wanted to sing it.” The singer revealed he contacted Cho Yong Pil afterwards and sent a guide version to him after being asked how Jaejoong would sing the song on stage. JYJ performing “Wake Me Tonight” in Osaka. Photo: C-JeS Entertainment. In July 2015, C-JeS Entertainment revealed that there were no plans for a DVD release although both The Return of The King and Ichigo Ichie tours share a similar concert set list and development. In November 24, 2015, it was announced that a DVD was planned to release on December 22, 2015. The second Tokyo show was filmed and released as a 4-disc live concert DVD where the third disc includes concert making films for the tour. 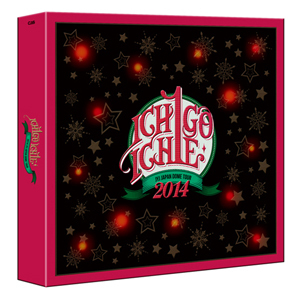 The fourth disc consists highlights from the Osaka and Fukuoka shows. The DVD set comes with a 200-page colored photo book, postcards and a pendant of the tour. The Korean edition was released on the same day. Japanese songwriter SHIROSE attended the first Tokyo concert on November 18, 2014 while singer-model Joseph “Joy” Greenwood came for the following day. This set list is representative of the performance in Tokyo. “Arukitai (歩きたい) (Walking Along)” was replaced with “Konayuki (粉雪) (Pink Snow)” for Jaejoong’s solo performance in Osaka. “Arukitai (歩きたい) (Walking Along)” was replaced with “Keshou (化粧) (Make-Up)” for Jaejoong’s solo performance in Fukuoka. Tokyo concert goods. Photo: C-JeS Entertainment. 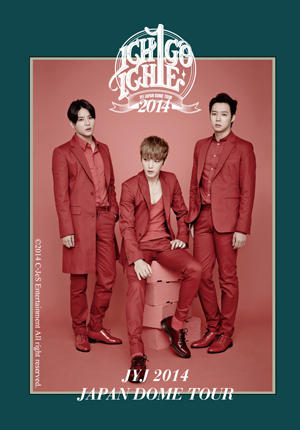 The list of goods was revealed four days ahead of the Tokyo concert through JYJ Japan Official Website. The sales of the merchandise for the Tokyo shows began at 9:00AM local time on November 18 and 19, 2014. On December 12, 2014, C-JeS Entertainment announced that no merchandise would go on sale at the venue for the Osaka shows due to an unfair demand stated on the contract from the local concert organizer. The goods, however, were later made available for order for its members on JYJ Japan Official Website the next day. 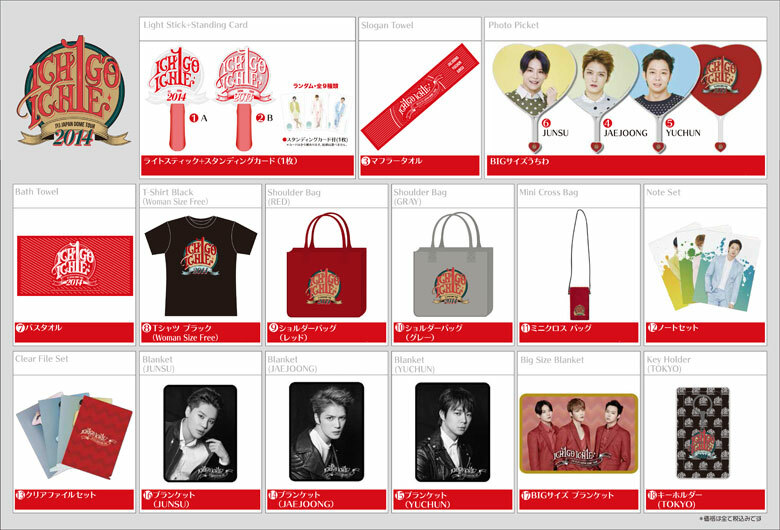 Compared to the goods in Tokyo, the new items on the website include three new individual light sticks of green (type C), blue (type D) and pink (type E), a new group edition photo picket, a grey T-shirt, a JYJ puzzle, new individual blankets, a keychain, sticker sets, and new standing cards. The same contract issue happened for the Fukuoka shows but C-JeS Entertainment announced on December 19, 2014 that the goods would be sold outside of the Fukuoka Tower instead. The sales of merchandise began at 10:00AM local time for both days. This list is representative of the sales in Tokyo. This table is representative of the sales on JYJ Japan Official Website and in Fukuoka. This page was last modified on January 7, 2016. 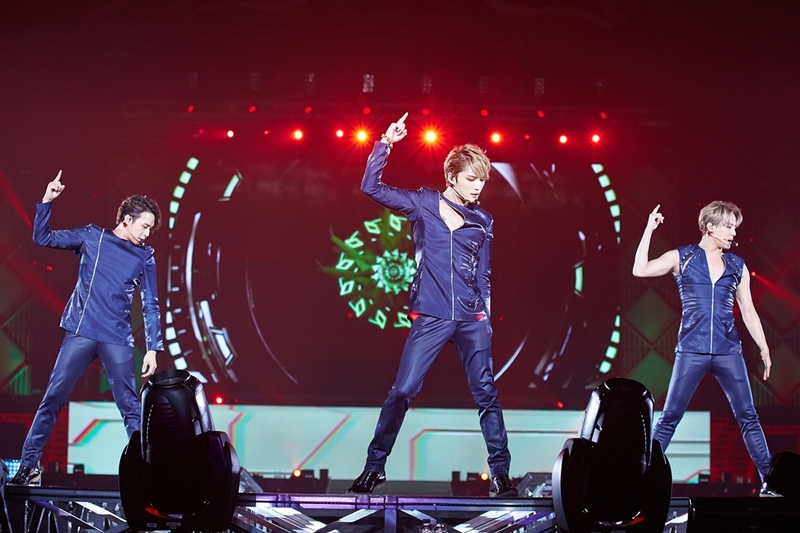 Hi, hellokpop site reported tgat JYJ Japanese concert tour draws 250,000 fans. So fukuoka concert should have gathered 2 nights’ fans close to 75,000. Can you update the correct attendance? I trust this source, from the concert photo on website, and report, the 2 nights’ seats were sold out. The Korean news, TV Daily, reported that the tour mobilized 240,000 people and this was shared by C-JeS Entertainment on its website and JYJ Official Facebook page. There is a difference in the actual number of attendance in many reports but since the vast majority of articles reported as 240,000, we’ve decided to go ahead with this figure. Kindly note that the total number of fans gathered in concert tours are of rough estimation only.